What is Smart Capture in SOLIDWORKS Inspection? SOLIDWORKS Inspection is an essential tool for organizations that create inspection documentation or would like to start creating inspection documents, but just can’t find the time. The program exists as both a stand-alone application that can be used outside of SOLIDWORKS, as well as an add-in that runs right inside of SOLIDWORKS and interfaces with native SOLIDWORKS 3D and 2D CAD files. SOLIDWORKS 2017 Standalone made the process of capturing inspection characteristics from 2D PDFs very easy. Once the characteristics had been recognized, inspection documentation could be generated automatically. Ballooned PDFs and First Article Inspection Reports were created with the click of a button in a variety of different formats matching multiple industry standards. Engineering is a process of constant improvement, though, and the developers behind SOLIDWORKS Inspection recognized that as great as the program was, they could make it even better. How does Smart Capture impact your workflow? 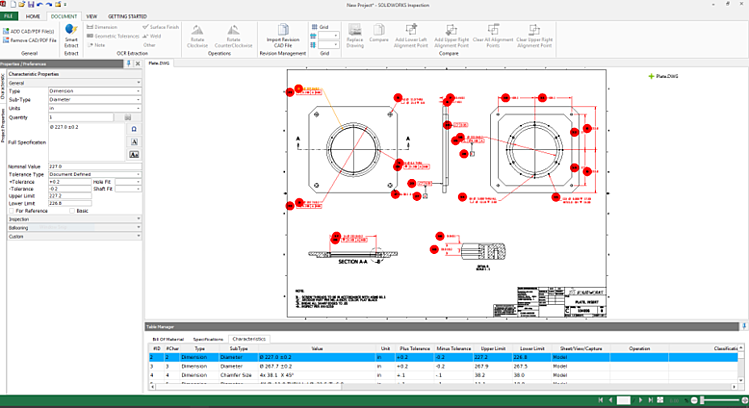 In SOLIDWORKS Inspection 2017, users could capture characteristics through a simple box selection of dimensions, annotations, or geometric tolerances. The downside was that these characteristics had to be captured one by one to make up your bill of characteristics. SOLIDWORKS 2018 makes this process even easier, by adding a new tool called “Smart Extract”. The Smart Extract tool allows you to simply click on each characteristic that you’d like to capture. Or, if you prefer, you can use a box selection around all the characteristics you wish to capture at once. Smart Extract will interpret the data on the drawing, and build out your bill of characteristics from every item in the selection field. This new tool speeds up the process of creating inspection documentation even more than SOLIDWORKS Inspection 2017 did. A fully ballooned drawing and a complete First Article Inspection Report can both be created in less than five minutes. Not only is the process faster than ever before, SOLIDWORKS Inspection also helps to remove the possibility of human error, while eliminating inaccuracies in the inspection documentation.